Air Wick brings you a brand new way to spark joy into your home. 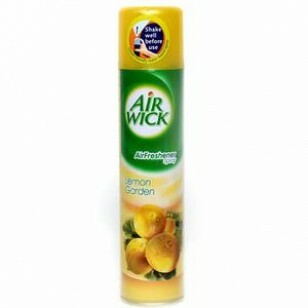 The Air Wick Lemon Garden Aerosol Air Freshener keeps the place that you call home smelling so fresh and exciting that everyone who has been in your house knows that rain or shine, they are in for a pleasant time while indoors. So be it that fancy dinner you are hosting at home or those unscheduled slumber parties your little ones can't get enough of - rest assured that there will be nothing humble about your abode from where they are looking. Its unique handheld design helps you reach over to those tricky sports and eradicate foul smell and unpleasant odour from the root source. Not only does the Air Wick Lemon Garden Aerosol Air Freshener eradicates the characteristic odour thats making life difficult for you, but it breathes a new life into your home, putting the personal touch right back into personal spaces. Infused with an aromatic blend of essential oils boasting of therapeutic and relaxing properties, this aerosol based freshener quickly spreads through the air and works its magic. Go ahead, breathe easy, thanks to the Air Wick Lemon Garden Aerosol Air Freshener.